Liam doesn't have a good seating system for the house. We have a Tomato floor sitter that can be used in a dining chair but he doesn't sit in it as well as I'd hoped. His tone is just so low in his trunk and the bum part is too big for his tiny cheekers. I belong to a facebook group where people can give away or sell their 'special' things. 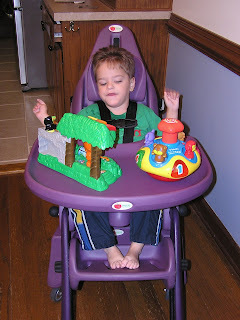 I just happened to be on when a mom listed that she was giving away a Special Tomato mobile chair in Liam's size! She only asked for shipping. I knew shipping would be high because it's heavy and an odd sized thing to ship. But, I knew that a few hundred dollars to ship a $2000 chair was still a bargain! The mom got a quote from UPS charging about $275. Still, a bargain, but I wanted to see if I could get it shipped cheaper through uShip. I have used them before and never had any problems. Imagine my shock when I got a quote from some guy saying he would deliver the chair personally to our door for $24.99! I admit I was stunned and confused at the low price because the next cheapest price I'd been quoted was $230. But Keith emailed me immediately upon placing the offer and explained the low bid. He said he was friends with a family who has a special needs kid and knew that costs were outrageous for the equipment that these kids need and he wanted to do us a favor because we were right along the path he was taking anyway.